Oliveira, L. C., Guedes, M. L. S., Silva, L. B. & Leite, K. R. B. Semi-arid temporary lakes of Bahia, Brazil: anatomy of amphibious species of Eleocharis R. Br. (Cyperaceae). Pan-American Journal of Aquatic Sciences, 12(2): 89-96. Download PDF file (936 Kb). Rocha, A. J. S., Botelho, M. T., Hasue, F. M., Passos, M. J. A. C. R., Cardoso, C. M., Vignardi, C. P., Ngan, P. V. & Gomes, V. Hsp70 and p53 expression in Gondogeneia antarctica amphipods collected in shallow waters around the Brazilian Antarctic Station �Comandante Ferraz� (EACF), Admiralty Bay, King George Island, Antarctica. Pan-American Journal of Aquatic Sciences, 12(2): 97-107. Download PDF file (1,078 Kb). Prata, P. F. S., Pires, D. M., Fonseca, D. B. & Dumont, L. F. C. Occurrence and quantification of the autofluorescent pigment neurolipofuscin in the brains of red shrimp Pleoticus muelleri (Bate, 1888) (Decapoda: Solenoceridae). Pan-American Journal of Aquatic Sciences, 12(2): 108-116. Download PDF file (369 Kb). Carranza, A., Martinez, G. & Arim, M. An endangered gigant marine gastropod: Adelomelon beckiiPan-American Journal of Aquatic Sciences, 12(2): 117-122. Download PDF file (441 Kb). Lira A. S., Lucena, F. F., Viana, A. P., Eduardo, L. N. & Fr�dou, T. Feeding ecology of Centropomus undecimalis (Bloch, 1792) and Centropomus parallelus (Poey, 1860) in two tropical estuaries in Northeastern Brazil. 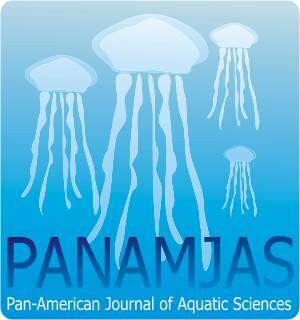 Pan-American Journal of Aquatic Sciences, 12(2): 123-135. Download PDF file (416 Kb). Vieira, T. B., Lajovick, L. C., Stuart, C. & Bastos, R. P. Icthyofauna from streams of Barro Alto and Niquel�ndia, upper Tocantins River Basin, Goi�s State, Brazil. Pan-American Journal of Aquatic Sciences, 12(2): 136-145. Download PDF file (611 Kb). Bosisio, F., Rezende, K. F. O. & Barbieri, E. Alterations in the hematological parameters of Juvenile Nile Tilapia (Oreochromis niloticus) submitted to different salinities. Pan-American Journal of Aquatic Sciences, 12(2): 146-154. Download PDF file (368 Kb). Chero, J. D., Cruces, C. L., Minaya, D. & Iannacone, J. Community structure of metazoan parasites of the Panama spadefish Parapsettus panamensis (Perciformes: Ephippidae) from the coastal zone of Tumbes, Peru. Pan-American Journal of Aquatic Sciences, 12(2): 155-165. Download PDF file (156 Kb). Barbieri, E. & Chiavone-Delchiaro, R. T. Influence of tide on composition of the bird fauna in Ilha Comprida, S�o Paulo, Brazil. Pan-American Journal of Aquatic Sciences, 12(2): 166-171. Download PDF file (414 Kb). Os�rio, F. M. & Godinho, W. O. Uncommon colour patterns of specimens from Acanthurus chirurgus (Bloch, 1787) and Thalassoma noronhanum (Boulenger, 1890) in Rocas atoll, Brazil. Pan-American Journal of Aquatic Sciences, 12(2): 172-176. Download PDF file (415 Kb).